Family Health and Sports Medicine (FHSM) has been recognized by the National Committee on Quality Assurance (NCQA), after much preparation on our part, as a Patient Centered Medical Home (PCMH). FHSM achieved initial certification as a Level 3 Practice in December 2010, and renewed their recognition for Level 3 in May 2016. What is a Patient-Centered Medical Home? It is team-based health care led by a physician or group of physicians. Each patient has their own physician who then leads a team of specially trained staff who collectively assist the physician in providing comprehensive and continuous medical care to patients with a goal of obtaining improved health outcomes. 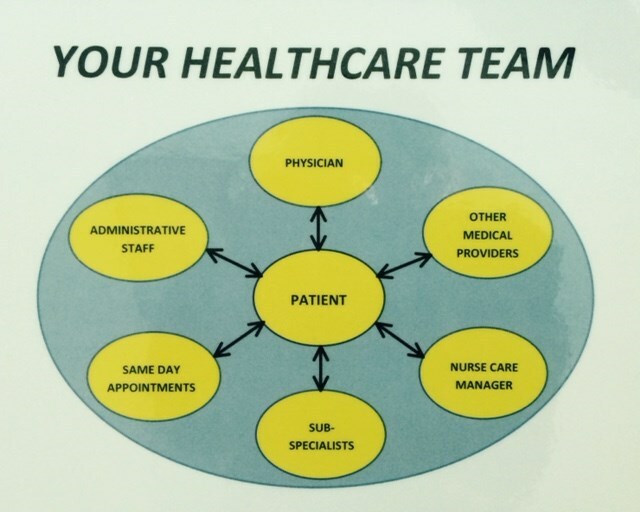 The “center” of the medical home is the patients. Family Health and Sports Medicine supports active involvement of patients in decision-making regarding their health care. “Patient-centered” means considering patients’ cultural traditions, personal preferences and values, family situations, social circumstances and lifestyles, as used by the Institute of Medicine and Institute for Healthcare Improvement. The “team” at Family Health and Sports Medicine consists of 3 doctors, 3 medical assistants, 1 office manager and 3 office assistants. In October 2008, another addition was added to the team, a nurse care manager (NCM). Our NCM has become as essential part of the team and coordinates all preventive care while working with our physicians and medical assistants. Our goal is for our entire staff to work together with our patients to provide support for chronic diseases such as diabetes, heart disease, and depression. We are also putting strong emphasis on helping people to quit smoking. Another important goal is preventive medicine. We want to identify health problems early, in order to work with our patients on prevention before these problems become serious illnesses. The NCM role is to provide education, training in self-management skills and counseling regarding nutrition and prevention of disease. Our Nurse Care Manager is a nationally Certified Diabetes Educator as well as Cardiovascular Disease Educator. She will assist with hospital follow up ensuring that our patients have had an easy transition back into their homes and are receiving proper care and appointments with their providers. The Nurse Care Manager is also responsible for outreach and developing care plans for our high risk patients, complex patients helping them to navigate the health care system, improving access, and communicating across the care team. This complementary role assists the primary care providers to deliver coordinated, accessible, comprehensive, and patient-centered care. We are continually working to improve care to our patients. We have added a depression-screening questionnaire to our medical record. This simple test has aided the practice in diagnosing cases of depression that may have not been otherwise detected. The NCM is able to offer individualized diabetes education as well as group classes for our patients. Smoking cessation education, cholesterol, and pre-diabetes are also some newer programs at FHSM. Family Health and Sports Medicine also now has part of our team a Behavioral Therapist, a Registered Dietician, and a Certified Diabetes Educator who work with the Care Team to help promote changes in behavior leading to a healthier lifestyle. The above are just some changes our practice has undergone is the last few years. Our goal is to promote wellness, prevent disease and do everything possible to keep all of our patients as healthy as possible. Take a look at this PCMH video.